The Temperance Almanac was primarily published for those already active in the campaign against alcohol. It provided its readers with information and arguing points to use in their efforts to persuade others. In the winter of 1833−34, Mr. Samuel Chipman, of Rochester, visited personally, every JAIL and POOR−HOUSE in the state of New York, and obtained from the officers, under their own signatures, (with one or two exceptions,) precise statements of the number of persons who had occupied them during the year 1833, with their habits, and from the county clerks the expenses attending the same. These certificates, with accompanying statements have been published by the N. York State Temperance Society in a pamphlet of 96 pages, and the whole constitutes one of the most important documents for the moralist, the philanthropist, or the political economist, ever published in this or any other country. It shows conclusively, that in this land of FREEDOM and of SCHOOLS, there would be almost NO CRIME, NO PAUPERISM, AND NO TAXES, but for the DISTILLER and the RUM SELLER. The following summaries have been made from these reports. Under the head intemperate, those only were included who were known to have been so. Under doubtful, those whose habits were not known positively, but whose appearance, rendered them suspicious. Under temperate, were placed young children and youths, old and infirm persons, foreigners and persons from distant parts of the country, whose habits were not known. Many of the children were known to have had intemperate parents. The above does not include great numbers who are tried for petty offences and fined, nor great numbers of paupers who are supported by towns and by private charity. Nor does it include houses of refuge, orphan asylums, insane, nor state prisons. The above does not include monies raised during the same year for the erection of Jails and Poor−Houses, nor town taxes. 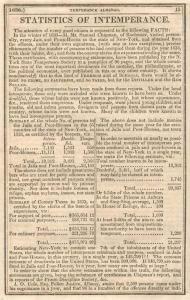 Estimating New York to contain one 7th of the inhabitants of the United States, the whole number of intemperate criminals and paupers, confined in Jails and Poor−Houses, in this country, in a single year, is 143,709!!! The common estimate of drunkards in the United States, has been 300,000. If 148,799 are confined in Jails and Poor−Houses, in a year, how many are probably at large? In order to show that the above estimates are within the truth, the following statements are given, being the substance of certificates in Chipman’s report, and in reports of the Prison Discipline Society. J.O. Cole, Esq. Police Justice, Albany, states that 2,500 persons came under his cognizance in a year, and that 96 in a hundred of the offences directly or indirectly originated in intemperance. G. Hogan, Esq. Jailer, states that “200 persons were confined in the Albany Jail, in a year, for whipping wives and abuse of families, and all intemperate. 100 cases of delirium tremens in the same Jail in a single year.” G. W. Welch, Esq. Superintendent of the Alms−House in Albany, states “that there was received into the Alms−House during the year, 634!! Not intemperate 1—doubtful 17—intemperate 616!! There were 297 in the house 1st January, 1833, making the whole in the year, 931. Mr. Guion, clerk of the Alms−House in New York, certifies, that besides the number returned as in the Alms−House in New York, viz, 5,179, there were relieved and supported out of the house in 1833, 3,830 families, averaging 5 persons each, making 19,150, and that of this number 3−4ths are brought to poverty directly or indirectly by intemperance. In Boston, E. M. P. Wells, Esq. superintendent of the house of reformation, says, of 450 in eight years, two−thirds were intemperate. Stephen Badlam, jailer, says, that of 9,936 commitments in Boston jail in ten years, more than half had been in the habit of indulging in the excessive use of ardent spirit. Dr. J. B. Flint, physician, says, more than three−fourths are hard drinkers, and considerably more than half confirmed drunkards. C. P. Sumner, Esq. sheriff, says, “I believe that about three−fourths of the criminals and about half of the debtors in all our jails, are addicted to intemperance.” Mr. Sumner has been sheriff about seven years. Expenses of supporting pauperism in Boston for ten years, viz:—House of Industry $194,087.67—out door* $131,370.92—total $325,458.59. The superintendent of the alms−house, Philadelphia, states that the expense of supporting paupers in that institution in 1833, was $130,000; and that 90 percent of the amount was attributable to intemperance. Similar examples might be furnished to any extent, but enough surely has been given to convince the most sceptical that our position is correct, viz: that at least four−fifths of the crime and pauperism in the United States are the result of drinking intoxicating liquors. A few plain Facts and Questions to Distillers and Dealers. FIFTY−SIX THOUSAND PERSONS die annually in this country from intemperance. The evidence of the fact is incontrovertible. QUESTION.—Who are the direct instruments in producing such a destruction of human life? unfortunate victims, with a full knowledge of its fatal qualities, and generally with the full knowledge of the habits of the individual to whom they furnish it. QUESTION.—If 56,000 persons are killed annually by intemperance, and if 73 million gallons of spirits are sold annually, how may a distiller or dealer know what number he is probably instrumental in destroying? ANSWER.—By ascertaining what proportion 56,000 bears to 73 million, which is about as one to 1,300, so that there is every reasonable certainty that every 1,300 gallons that is made or sold destroys one human being!! 148,799 persons are confined during the year in jails or poor−houses. Certificates from numerous keepers and officers place the fact beyond all dispute. QUESTION.—If 73,000,000 gallons send 143,799 persons to the jail or alms−house annually, what will the average be for one person? ANSWER.—183 gallons, or every dealer may reasonably calculate that for every 183 gallons that he sells, one person will be driven to crime or reduced to poverty. TESTIMONY IN FAVOR OF TEMPERANCE. PRESIDENTS.—Being satisfied from observation and experience, as well as from medical testimony, that ardent spirit as a drink is not only needless but hurtful, and that the entire disuse of it would tend to promote the health, the virtue and the happiness of the community—We hereby express our conviction, that should the citizens of the United States, and especially all YOUNG MEN, discontinue entirely the use of it, they would not only promote their own personal benefit, but the good of our country and the world. Thomas Jefferson also left on record his unqualified condemnation of the use of ardent spirit. COLD WATER DRINKERS.—More than 1,500,000 cold water drinkers, most of whom have formerly drank spirits, embracing farmers, mechanics*, merchants and professional men, all unite in saying that cold water is the only true and safe drink—that they enjoy much better health and spirits than while they used intoxicating drinks. AMERICANS!—Would you be healthy, happy and FREE?—Abandon the whole tribe of intoxicating drinks. Confine yourselves to the pure element that springs from your thousand hills, and flows through your beautiful valleys, and was designed by a wise and bountiful Providence, to quench the thirst and promote the health of his creatures.